There is insufficient evidence to determine what Viking-age people ate and how their food was prepared. While the raw materials and the cooking utensils are found in archaeological studies, the ways in which foodstuffs were combined, prepared, and presented are largely unknown. In addition, diet probably varied quite a bit across the Norse lands, depending on climate and available resources. The best available guess is that Norse people primarily ate agricultural products raised on their own farms: meat from cattle, sheep, horses, pigs, goats, and poultry; cereals, such as barley, rye, oats, and (rarely) wheat; dairy produce, such as milk from cows, sheep, or goats, as well as cheese and butter; vegetables, such as peas, beans, cabbage, onions, and an assortment of herbs; and wild fruits, such as apples, pears, cherries, and berries. Many foods commonly consumed today were unknown, such as corn (maize), potatoes, and sugar; the only available sweetener was wild honey. To these foods would be added whatever could be hunted, captured, or gathered. Along coastal regions, and near rivers and lakes, fish were a staple part of the diet. Fish were caught with hook and line from small boats. 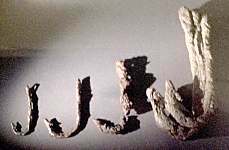 (Two 10th century fish hooks are shown to the left.) On lakes or streams, nets were used as well. Saga evidence suggests the importance of fishing. Laxdæla saga (ch. 14) mentions a fishing station at Bjarneyjar, and the author says that at the time of the saga, people went there in great numbers and that some stayed year-round. It's likely that fish was the most important food wherever there was a concentration of people, such as in trading towns, or at the annual Alþing assembly. The fish from Þingvallavatn (right), the lake adjacent to the Alþing site, provided the food needed for the thousand or so people who attended the assembly. Some sources suggest that whales were driven ashore by Norsemen in their ships, where they were killed, providing a bounteous harvest for an entire settlement. 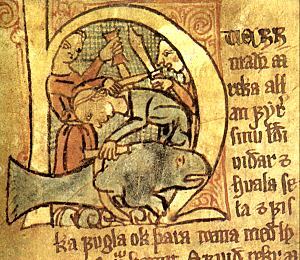 More probably, Norsemen simply took advantage of dead or weakened whales that washed ashore. The picture to the left is an illumination that appears in the Jónsbók manuscript. It shows men flensing a whale on the shore. 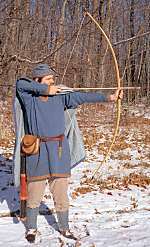 Wild animals were hunted for food, using either spears, or bow and arrow. These include deer, bear, boar, and elk, as well as smaller game such as rabbits. In the far north, seals and walruses were hunted, not only for the meat, but also for the skins which were especially valuable. 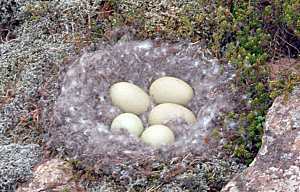 Sea birds (right) and their eggs (left) were also a part of the Norse diet. Norsemen harvested both the eggs and the birds from the cliffs on which the birds nested by swinging down from the top of the cliff on ropes. A variety of birds and their eggs were collected and consumed. The great auk (Pinguinus), a large, meaty, flightless bird now extinct, was an important part of the diet in Viking-age Iceland, based on excavated bones. Some wild plants were probably consumed because of the medicinal qualities they were known to possess. For instance, the leaves of scurvy-grass (Cochlearia officinalis, shown left) were known to help prevent one's teeth from falling out, one of the symptoms of scurvy (vitamin C deficiency). The plant is mentioned in the stories (for instance, chapter 73 of Grettis saga), but its medicinal properties are not, making me wonder if it wasn't until later in the medieval period that the beneficial properties became known. The stories do suggest that scurvy (skyrbjúgr) was known to sailors in the Viking age (chapter 4 of Þorsteins saga hvíta). 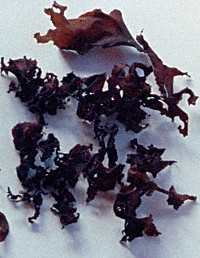 Dulse (Palmaria palmata) is a red alga that can be easily harvested from shore, dried, and stored for long periods (right). It's delicious and is an excellent source of many vitamins and minerals. Meat and fish were preserved by smoking. While some excavated Viking-age farms appear to have had dedicated smokehouses, such as the farm at Granastaðir in north Iceland, the upper reaches of the longhouse may have been smoky enough to do the job. Smoked lamb hanging from the kitchen beams in the longhouse at Eiríksstaðir is shown to the left. Despite its thoroughly unappetizing appearance, the meat is delicious. Another methods of preservation is drying. 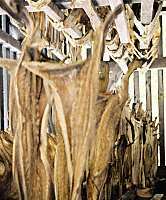 The photo on the right shows fish drying outdoors in an open shed in modern Iceland. The dry, cold wind removes the moisture and preserves the fish before it can spoil. 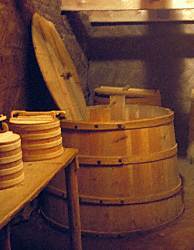 Cooked meats were preserved in vats of sour whey (súrr). The lactic acid in the sour liquid prevented the meat from spoiling. Large vats found in some Viking age house sites held preserved meat in sour whey, as well as other stored dairy products. The photo shows a reconstructed dairy vat at the house at Stöng in south Iceland. Comparing the size of the hand bucket on the table to the dairy vat partially set into the ground gives a sense for the size of these vats and the large quantities of stored foodstuffs they could hold. Salting meats to preserve them was known, but appears to have been much less commonly used in the Viking age than these other methods. The most common method for cooking food was by boiling it. Meat was sometimes prepared by boiling it in a wood-lined pit. A pit was dug and lined with wood. Meat and water were placed in the pit, and hot stones were dropped in to bring the temperature up to boiling. More hot stones could be added as needed to keep the liquid hot. The liquid was seasoned with whatever spices and herbs might be available. 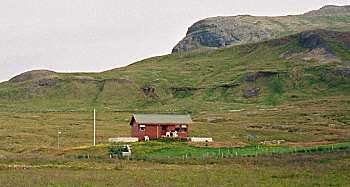 Eyrbyggja saga (chapter 54) tells that the farm at Fróðá (shown to the right as it appears today) was troubled by ghosts, who came to the fire-room of the house and drove away the living residents of the house. As a result, they had neither light nor heated stones nor any of the other comforts of the fire to which they were accustomed. Hot stones were not only used for cooking, but also for drying and for warming. Thus, many longhouses had means to heat stones. 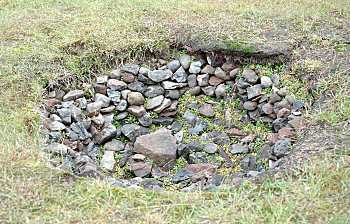 The outdoor firepit at Vatnsfjörður used for heating stones is shown to the left. Meat could also be roasted on a spit. The sketch shows a spit found in Norway, with an elaborate handle, allowing the meat to be turned as it roasted over the fire. The spit probably rested on forked sticks on either side of the fire. More commonly, food was boiled in soapstone or iron cauldrons. A reproduction Norse era cauldron is shown to the left. Cauldrons were constructed from a number of thin iron plates riveted together to form the pot. The photo to the right shows a modern replica in use, suspended from a tripod over an outdoor camp fire. The cauldron holds a stew made of pork, cabbage, leeks, and spices. Underneath it, flatbread cooks on a skillet. The iron tripod shown in the photograph was probably not a common item in the Viking age. A tripod of that nature would only have seen use while traveling, since at home, other means were used to suspend the cauldron. It would not have been economical for a Viking-age family to tie up that much costly iron in a tripod that only saw occasional use. More likely, wooden saplings were cut to form a tripod as needed while traveling. At home, the cauldron was suspended over the central firepit by an iron chain or hooks that hung from one of the overhead house beams. Hanging cauldrons are shown in the hall at Eiríksstaðir (left) and at Stöng (right). At Eiríksstaðir, flatbread is being cooked on a skillet in the fire below the cauldron. The pot-chains and kettles had other uses, too. Reykdæla saga og Víga-Skútu (chapter 28) says that Skúta placed a kettle and pot-chains above his bed. The chain was arranged so that if anyone entered his bed-closet while he was sleeping, the chain would fall into the kettle, making enough noise to wake him. The trick saved his life, until his enemies discovered the mechanism and silenced the pot-chains. 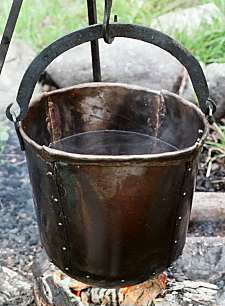 The medieval Icelandic lawbook Grágás (K 246) states the standard dimensions of an iron cauldron: a weight of half a load (40 pounds, or 18kg) with a capacity of eight bucketfuls (7.5 gallons, or 30 liters). The thickness of the iron required would have been nearly 1/4 inch (about 6mm). That much iron would have represented a small treasure in the Norse era, so cauldrons this large couldn't have been common. Typical cauldrons found from the Norse era are smaller than this standard. However, in chapter 145 of Brennu-Njáls saga, Sölvi was boiling meat in a cauldron at the Alþing. The cauldron was big enough that when Hallbjörn picked him up and plunged him head first into the boiling cauldron, Sölvi was killed instantly. Food was also prepared by roasting in soapstone pots. While clay pottery (left) was known in Norse lands, almost no broken potshards have been found, as in other parts of Europe. Pottery was probably a poorly developed craft in Norse lands, and soapstone must have been used almost exclusively. Some lands, such as Iceland, had little clay available suitable for pottery, making it even less likely that clay pottery was commonly used. Soapstone has the advantage that it can be pierced, allowing it to suspended by iron hooks over the fire. Additionally, if broken or cracked, soapstone can be repaired with iron staples, unlike pottery. Liquids that needed to be warmed were poured into a suspended animal skin, and then hot stones were dropped in. Guðmundur was served hot milk heated by stones with his meal, as is told in chapter 21 of Ljósvetninga saga. He complained that it wasn't hot enough. In some Norse households, stone ovens were used. Small stones were heated in the open cooking fire and then rolled into the oven to heat the interior for cooking food. Ovens have been found in excavated Viking-age house sites, and stones cracked by repeated heating in the fire are common finds at these sites. 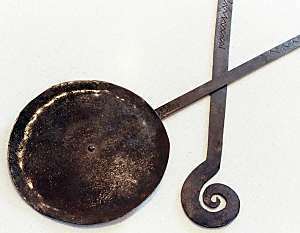 Reproductions of two different utensils for frying food are shown in the photo to the right. The gridiron (on the right in the photo) was used for cooking meat or fish over an open fire. The pan of the griddle (on the left in the photo) is fixed to the handle with a single rivet, so it rotates at the end of the handle. At one time, it was thought that this allowed the pan to be rotated in the fire, allowing more even cooking. While the rotating pan does allow more even cooking, that suggestion has been partially discredited by finds in which the pan is fixed to the handle with two rivets, preventing the pan from rotating. 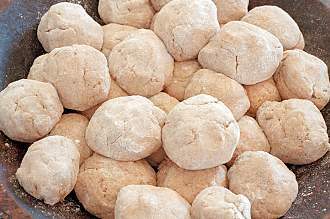 Bread was typically made from unleavened barley flour ground in stone querns (left). 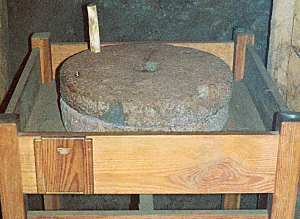 The handle of the quern was used to rotate the top stone over the bottom stone, grinding the grain between the stones. In Iceland, lava querns were used, which produced finer flour. Stone chips from querns have been found in recovered flour, so the bread must have made for a gritty repast. The bread dough shown to the right was made from stone ground wheat, barley, oat, and rye flours, mixed with whey, honey, and nuts. The dough would then be flattened and cooked on a flat pan over the coals of an open fire (left). The bread would have been eaten warm, since such loaves turn rock hard when cooled. It seems likely that women prepared and served the food in the home. 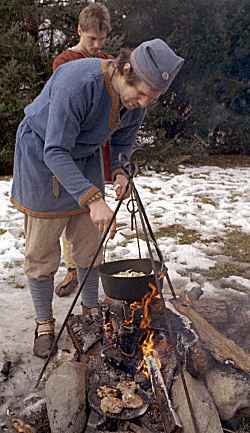 There is one example in the sagas of a man preparing food at home who was mocked for it (Vatnsdæla saga chapter 44), although the sagas suggest that away from home, men prepared their own food (for example, at assemblies, on-board ship, and at game festivals). Ale, made from malted barley, was the staple drink of all classes and all ages, although milk, beer, mead, and fruit wines were also known. In Iceland, at least some of the malt was imported. Chapter 11 of Víga-Glúms saga says that Árnorr went to fetch malt at the trading center at Gásir, in preparation for his wedding feast. On his way back, Árnorr met up with Þorgrímur, whose marriage proposal to the same woman had been rejected. Þorgrímur and his men attacked with drawn swords. Árnorr escaped, but he lost his malt. Þorgrímur said he wasn't completely out of luck: "We'll drink the ale even if we can't have the woman." To make ale, barley grain was soaked in water and allowed to grow until shoots just began to sprout, creating malt. The malt was dried, crushed, and heated in hot water to release the malt sugars needed for fermentation. 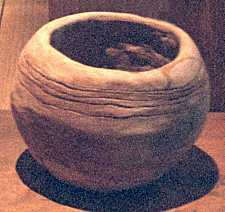 The heating may have been done in an iron cauldron, or in a wooden vat, using hot stones dropped into the liquid to heat it. The liquid was allowed to ferment and then flavored. Norse feasts and parties must have been alcoholic to excess, if the stories are to be believed. Because of the impurities in the drink, there must have been some head splitting hangovers the following morning. The proper way to drink was "without restraint", according to some sources, and the stories suggest that was the rule. Yet Hávamál (Sayings of the High One) recommends in several verses (e.g., 19) that one should drink with moderation. 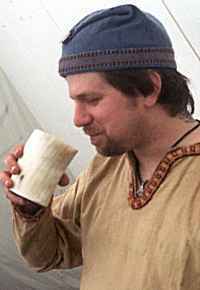 When Hárekr challenged Brandr to drink, Brandr declined, saying that he didn't have such an excess of wits that he wanted to drink them all away, as is told in chapter 8 of Ljósvetninga saga. Norse families ate two meals per day: dagverðr at mid-morning, and náttverðr in the evening. Most families had a table of some sort, and wealthy families used a linen tablecloth. Meats were served on wooden trenchers and eaten with one's personal knife. 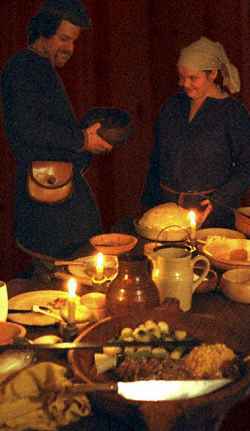 Stews, porridge, and similar items were served in wooden bowls and eaten with wooden or horn spoons (right). 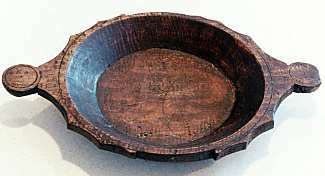 A reproduction of a wooden serving bowl is shown to the left. Shells were used for ladles and spatulas. 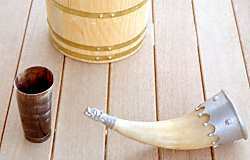 Cold beverages were consumed from wooden cups or (especially for feasts) from drinking horns. Modern replicas are shown to the left. Cups made from metals such as copper or silver were also used. Evidence for the horn cups shown in the photographs is slight. While glass drinking vessels are known to have been used, their cost must have limited them to only the wealthiest of families. The glass beaker shown to the right predates the Viking age, but resembles glass beakers from the Viking age. It was found in Valsgärde in Sweden. Meals were eaten in the longhouse, while sitting on the benches. It's likely that trestle tables were set up for meals and stored overhead on the rafters when not needed. A modest longhouse, such as Eiríksstaðir, would scarcely have room for tables in the space between the two benches. Meals in these houses may have been taken without tables. Autumn was the season when the greatest variety of foodstuffs were available. 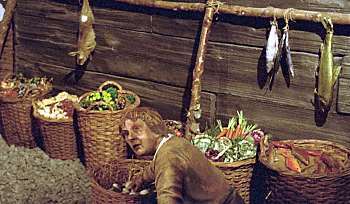 It was when freshly slaughtered meat was most available, when fresh vegetables and grains were available, and when imported foodstuffs were most abundant. Feasts and celebrations were planned for the fall to take advantage of this abundance and variety. The image to the right depicts the variety of food available in York during the Norse era and includes fish, small game, vegetables, nuts, and fruit. There is nothing to indicate that poor quality food or cookery was accepted in the Norse era. Spices were available and were used, not to disguise the taste of food gone bad, as is commonly thought, but to enhance the flavor of food. Based on current knowledge, it is quite possible that a varied and nourishing diet was available. But there is insufficient data to say how much of the population was able to take advantage of such a diet. At our modern re-creations of Norse feasts, I think we are continually surprised at how savory these foods can be. Norse Era Nutrition: After writing this summary of dietary practices in the Norse era, I was curious how Norsemen avoided deficiency diseases, such as scurvy (vitamin C deficiency). To find out, I did a nutritional analysis of hypothetical Norse era diets made up from the foods described in this article, using diet analysis research software developed at Syracuse University. I created hypothetical meals, using the foods that probably were available, creating different diets for each of the four seasons of the year. I assumed that a variety of foods were readily available, so this study is not applicable to times of famine, or to Norse era town dwellers. For the first analysis, I assumed the kind of serving sizes that we consume during Hurstwic feasts. That analysis showed that it would be possible for people living in the Norse era to have a well balanced diet, even on a winter diet. Although some of the nutrients would have been a bit low by modern standards (for instance, less than 40mg of Vitamin C on the winter diet), no essential nutrient was so low as to suggest ill health, with one exception: energy. With this much food intake, the analysis showed that all the key nutrients were consumed in adequate quantities. However, even a 3000 Kcal diet was probably insufficient to cover daily energy expenditures during some of the year. I analyzed required caloric levels for a hypothetical day of Norse era farm chores and hand labor. A energy expenditure of over 10000 Kcal (42MJ) was predicted. The details of the diets and the analyses are provided on a separate page for those interested. These analyses suggest that people living in the Norse era probably didn't routinely suffer from diseases due to nutritional deficiencies. Assuming they had access to a variety of foods known to be eaten during this era, they would have been able to get their required nutrients, even during winter. Archaeological evidence confirms this conclusion. A recent study of 11th and 12th century skeletal remains from Skeljastaðir in Þjórsárdalur in Iceland showed little evidence of nutritional deficiencies. However, people in this era must have eaten surprisingly large quantities of these foods in order to fulfill their energy needs, with serving sizes several times larger than would be considered normal today. Thanks to Sarah H. Short, Ph.D., Ed.D., RD, CD/N, FADA for her assistance with these analyses.